1 cup edamame (shelled), microwaved for a couple of minutes with a few tablespoons of water until just tender. Salt the pasta water and cook the pasta per package directions until al dente. To a food processor, add the edamame, tofu, garlic, watercress, cumin powder and red pepper flakes. Add salt to taste. With the motor running, drizzle in the olive oil until the pesto comes together in a smooth, creamy sauce with a lovely pale green color. 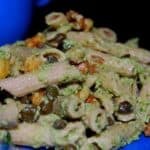 Remove the cooked pasta to a bowl and add the pesto sauce, capers and walnuts. Toss to coat the pasta evenly with the sauce. You can also add some pre-roasted veggies like bell peppers and zucchini or even some sliced avocados for a delicious and healthy meal in minutes!